Even though Black Mamba has a strong base of active ingredients that can well do the trick when it comes to fat burning... Unfortunately, it fails to deliver with a good amount of people and even leaves some of them with serious side effects. So, is Black Mamba worth it? Let's find out! Whether you are looking for a potent fat burner or just something that will help you lose a few extra pounds, this product might seem like a good bargain. Especially so as it is currently on discount. So, what does Black Mamba have that other similar products don’t? Why should you buy it? Well, for starters, Black Mamba Pills contain powerful ingredients. More precisely, it packs whopping 65mg of ephedrine which makes it one of the strongest ephedrine supplements on the market. With that in mi nd, there is no doubt you will notice a strong before and after effect. It’s just something that ephedrine is known for. That being said, I’d like to take you through some of the key aspects of Black Mamba. Ingredients, testimonials, clinical research and all that good stuff will be thoroughly analyzed within this review. So, if you are interested in Black Mamba, it might be a good idea to pay attention and read till the very end! Before listing out all of Black Mamba’s ingredients, we’ll take a look at its label to see all detailed dosing information. Caffeine Anhydrous 200mg A relatively high dosage for Caffeine which suggests you should not drink caffeinated drinks as they will get you overly hyped up throughout the day. Ephedra Extract 65mg Ephedra is a powerful fat burning agent that works wonders for people who are on a good diet plan and are working out as much as they can. Senegalia berlandieri, commonly known as Acacia Rigidula extract, this substance provides with 150mg worth of Phenylethylamine alkaloids and is a powerful weight loss agent. Methylhexanamine HCL AKA DMAA, is a powerful stimulant that boosts energy and increases mood. Yohimbine is helpful for stopping food cravings and preventing excess storage of fat inside your body. Hordenine HCL increases adrenaline and noradrenaline production which results in prolonged focus and fat burning. Considering the sheer amount of well-known weight loss ingredients this supplement has, I’m pretty sure it can do what it claims. On a side not, with so many ingredients in its proprietary blend, there will definitely be some side effects related to them… but don’t worry, we got side effects covered down below! Since Black Mamba pills have a significant dosage of Caffeine (200mg per serving), it might cause headaches, jitters and insomnia to people who aren’t used to it. In addition to that, it might also be a good idea to pause with caffeinated drinks as they could just worsen the possible caffeine related side effects. Going back to the side effects, it’s alarming to see that many users are having complaints: “I really had high hopes for Black Mamba pills but when I started using them, they did nothing but give me strong headaches”. While jitters and headaches are most likely caused by Caffeine, irregular heart beat is probably caused by Yohimbine. Additionally, if you are pregnant, breastfeeding or have anxiety or PTSD, stay on the safe side and avoid using this supplement as it could cause issues with your newborn or worsen the effects of your illnesses. Black Mamba Reviews – What Do Its Users Have To Say? Now that you know a bit more about the ingredients, it is time to check out Black Mamba feedback as well. As you all probably know, one of the most important aspects of every supplement is the opinions its users have. That’s the key to knowing whether a supplement is good or not! So with that being said, let’s take a closer look at a couple of Black Mamba reviews! As you can see, the first 2 Black Mamba reviews aren’t exactly the most positive ones out there. 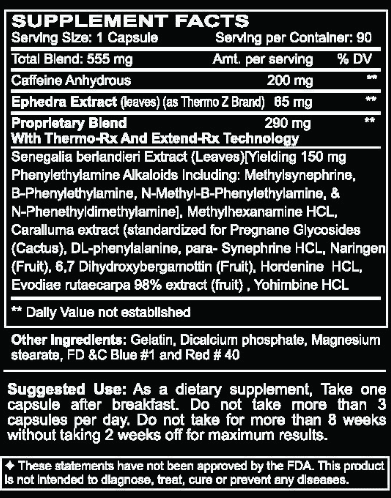 Like I mentioned above, side effects could be an issue with this supplement due to the combination of caffeine and ephedra, both of which have relatively big dosages. Scared of side effects – Beware! As I already mentioned below, Black Mamba is one of those supplements that possess extremely powerful ingredients. Both Ephedra and Caffeine tend to cause many problems, especially people who aren’t familiar with them or haven’t used them before. It’s a double-edged sword, that’s for sure – you can expect great results from it if your tolerance is on par… but if it’s not, you might end up with a lot of issues. Most frequent ones are definitely high blood pressure, mild headaches and jitters. These could evolve into more serious issues such as dizziness and strong headaches which are, as I’m sure you know, a pain to deal with. In the end, the final decision is completely up to you. If you think your body can tolerate these ingredients and you are not afraid of headaches, then go for it. On the other hand, if you don’t have any experience with caffeine (f.e. You don’t drink coffee), you might want to stay away from it since it could cause some nasty side effects. EDITOR’S TIP: If you are a female, check out Royal 21 Queen if you want a worry-free experience! EDITOR’S TIP: If you are a male, check out Royal 21 King if you want a worry-free experience! Where to buy Black Mamba? If you aren't that worried about those potential side effects and you see a real opportunity provided by the powerful active ingredients in this product, then you must be wondering where can you get your hands on it. Unfortunately, Black Mamba can only be found in online stores. The best deal available is at ephedrawarehouse.com where Black Mamba is currently at a huge discount. Black Mamba seems like a solid fat burner with a ton of Ephedra and Caffeine. While it's certain it can give you the effects and results you desire, the problem with side effects remains. But, despite that, if you consider yourself an experienced bodybuilder with a good tolerance on both Caffeine and Ephedra, you should definitely give it a go! If you'd like a safer alternative that does not have so many side effects, check out my choice here! Most popular energizer and stimulant in the world. There are many studies that show just how powerful caffeine is. All of its energizing and stimulating effects have been confirmed which is a well-known fact not just in the bodybuilding world but everywhere else as well! Ephedra is a herb whose branches, roots and tops are used for all sorts of medicines. Ephedra has powerful fat burning properties which can lead to exceptional results with people who have a solid diet and are actively workout out. Ephedra has a ton of research studies that are focusing on its fat burning and weight loss effects. Here you can find a 6-month trial that tested the efficacy of ephedra weight loss products. There have been many complaints in the past about caffeine usage resulting with this side effect. Higher than average blood pressure that can result in potentially life-threatening scenarios. Increased blood pressure is yet another side effect most likely caused by caffeine, although ephedra is known to cause it as well, but on rarer occasions. A relatively awkward feeling of nervousness stretching throughout your entire body. Jitters are most likely a side effects caused by the combination of both ephedra and caffeine. How much does Black Mamba cost? The regular price of Black Mamba is pretty high – around $90. Luckily, you can find it on sale on various online stores. For most of the people, Black Mamba pills sure do work. But, pay close attention to any possible side effects that might occur as they are pretty common. Where can I buy Black Mamba? Should you drink coffee when using this? If you are used to drinking A LOT of coffee then I guess you can have 1 cup per day while using Black Mamba. On the other hand, if you were just drinking a single morning espresso, then it is most likely that your body isn't that tolerant to caffeine so you should not drink coffee while using Black Mamba. As I've said at least 5 times earlier – Black Mamba comes with enough Caffeine on its own! Black Mamba pills can be purchased only through online stores. As I've already shown you above, the best deal can be found on ephedrawarehouse.com where you will pay only $34.95 for it!